One of the biggest problem when resealing a Benjamin Discovery or Marauder air rifle is how to prevent the valve and gauge port O rings from being clipped during reassembly. It's almost impossible to prevent this damage as the new O rings swell out into the gauge port hole in the tube and then are cut in that area as they push further into the tub past the hole. These cuts almost inevitably lead to leaking - which is often why the gun was taken apart in the first place, of course! Now Archer Airguns offers a solution to this issue. It's the Filler Plugs for Benjamin Marauder and Discovery air rifles. In the factory, Crosman uses a jig that closes the gauge port hole when the valve and Gauge Port are installed. This prevents damage to these O rings during assembly. These new Filler Plugs provide a much simpler - and cheaper - method of achieving the same effect. The Filler Plugs are precisely-sized, er, fillers that are used to close the gauge port hole during reassembly. 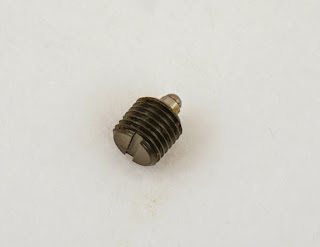 Above, the Filler Plug for Marauder Air Rifles. The Filler Plug is simply held in place by hand when reinstalling the valve and gauge port, keeping the O rings depressed as they are pushed down past the gauge port hole. Simple but effective! There's one Filler Plug to fit the Benjamin Marauder Air Rifle, a second version fits the Benjamin Discovery and Crosman Challenger 2009 air rifles. They're identified by an embossed "M" or "D" in the underside of the Filler Plug. Above, the Filler Plug for Discovery. The illustrations shown here are CAD files of the parts. The real ones are solid black and very difficult to photograph! Many times at Archer Airguns, we're asked for our recommendation for how to clean airgun barrels. Now we have an answer - at least for .177 caliber! Bore-Whips are supplied in packs of three. They comprise a flexible, yet sturdy synthetic pull through with a lint-free foam tip bonded to this "rod". 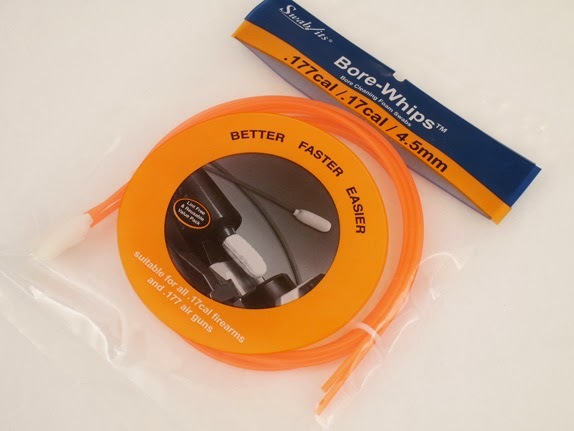 We're told by the manufacturer that Bore-Whips will soon be available in .22 caliber. Archer Airguns will carry these also as soon as they are available. Also now available are more parts for Benjamin Marauder air rifles. The improved valve featured in the new generation Marauders is now available for use in .177 and .22 caliber Marauder air rifles. It's Crosman part 1764-100 and it's suitable for use in all Benjamin Marauder Air Rifles, both first and second generation guns. 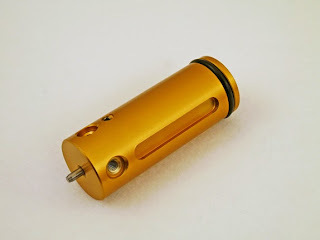 This new valve has a yellow anodized finish. So, don't confuse it with the first generation Marauder .25 caliber valve, which is also the same color! One more Marauder air rifle parts assembly now in stock is the breech Plunger Assembly, Crosman part 1763-106. Again, this fits both first and second generation Marauder air rifles, it restrains the bolt travel under operation. Many Marauder air rifles sent to Archer Airguns for repair have this Plunger Assembly damaged and I'm not sure why. There's no need to crank down tightly on the screw! 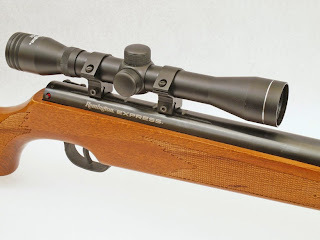 New Test Review of Remington Express Air Rifle. Just added today to Hard Air Magazine is a test review of the Remington Express air rifle. This Chinese-made airgun looks beautiful, and much of it is well designed. But there's just one feature that's missing. It has no scope stop! The result is vertical stringing in HAM's test targets when shot using a scope. If you shoot with open sights, however, the Remington Express could be a great choice for a "1,000 FPS" springer. 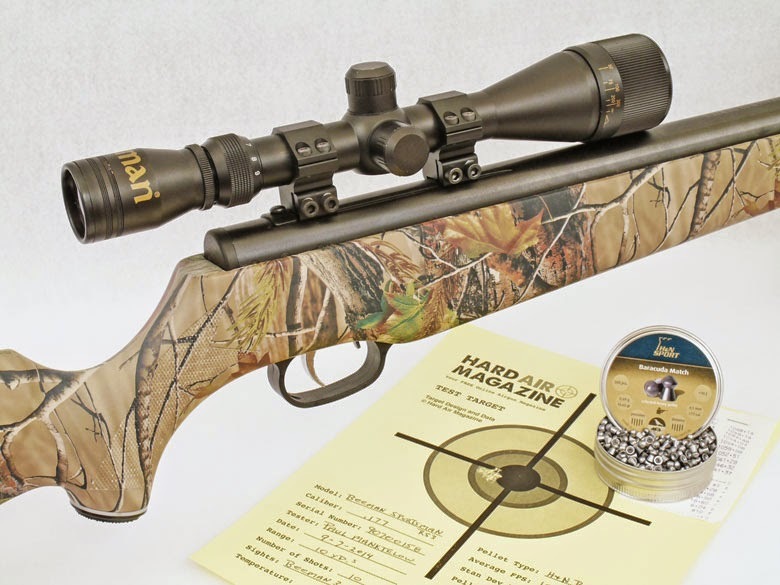 A comprehensive test review of the Beeman Mach 12.5 air rifle was recently published in Hard Air Magazine. The Mach 12.5 is a Chinese-manufactured model and it certainly packs a big punch with a maximum muzzle velocity approaching 1400 fps - making it ideal as a hunting air rifle, even if you wouldn't want to shoot it all day for plinking!